Making Inodes Behave by Clay J. Claiborne, Jr.
Claiborne describes the difficulties he encountered while building Linux systems for General Dynamics. Mason gives a tour through the Reiser File System: its features and construction. 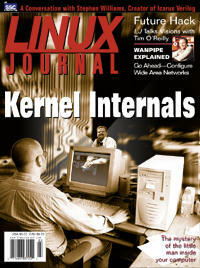 Herlein explains the integration of the telephony device driver into the Linux kernel. Corbic and Mandelstam discuss the structure and user interfaces to the WANPIPE drivers as they have evolved and currently exist. Using legacy languages like C and Fortran can aid computationally complex web applications. Coding for portability to Linux: examples from the ACRT land vehicle port. The role of Linux in the future of clustering. Ouallin details the enhancement of the Vim vi clone. An interview with Stephen Williams, the creator of the Icarus Veriolg compiler. One company takes the initiative and saves time and money using a Linux Beowulf cluster. The “Next Bang” prophecy fulfilled. Open-source software development provides an inspirational model for books.